Kitchen La Bohème: EASY DELICIOUS VEGAN | Shortcakes with Strawberry Basil Sauce and Vanilla "Ice Cream"
EASY DELICIOUS VEGAN | Shortcakes with Strawberry Basil Sauce and Vanilla "Ice Cream"
I have a weakness for sweet desserts that transcend the norm — that is, sweet desserts that taste incredible and are also missing a few key ingredients. For example, if you were challenged to make traditional, mouth-watering shortcakes without using butter or cream, how would you do it? Read on to find out! 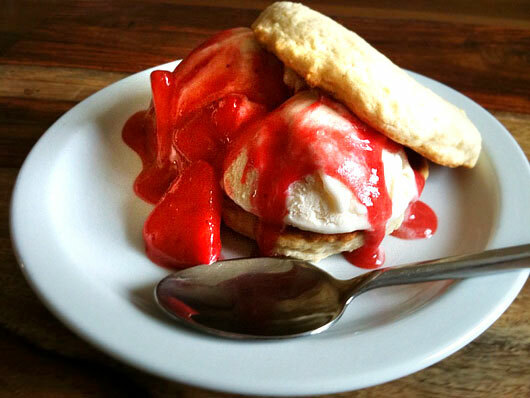 SHORTCAKES WITH STRAWBERRY BASIL SAUCE AND VANILLA "ICE CREAM"
Make the Strawberry Basil Sauce: Place half of the strawberries, the lemon juice, salt and basil sprig in a small saucepan and bring to a simmer over medium heat. Cook, stirring frequently to break up the strawberries until they are soft and broken down. Remove from the heat and let steep for at least 20 minutes (you can make this ahead and let it steep overnight). Remove and discard the basil, then pour the sauce into a blender. Puree, then add agave nectar and sweeten to taste. Push the sauce through a fine-mesh strainer back into the saucepan and gently fold in the remaining sliced strawberries. When ready to serve, heat over low heat until the sauce is warm. If you prefer, you can also refrigerate the sauce and serve it cold. Make the Shortcakes: Preheat the oven to 425° F. Line a baking sheet with parchment paper, or tin foil sprayed with cooking spray. Sift the flour and baking powder into a large bowl, then stir in the 1/2 cup sugar and salt. Scatter the shortening into the flour mixture and cut it into the flour until you're left with small chunks. Make a well in the center of the mixture and add the creamer. Gently stir to make a soft, somewhat sticky dough, being careful not to overwork. Using a large spoon, transfer one spoonful of dough per shortcake round onto the baking sheet (you should get 10) and gently flatten to about 1 inch thickness with your fingers and the spoon to form a circle. Bake in the middle of the oven until golden brown, about 12 minutes, rotating the pan 180 degrees halfway through. When you rotate the pan, pull it out and brush shortcake tops with soy creamer and sprinkle on the remaining sugar before returning them to the oven for the remaining time. Remove to a wire rack to cool. Prepare the Shortcakes to serve: Place one shortcake round on a plate and top with two scoops of the vanilla non-dairy ice cream. Generously drizzle Strawberry Basil sauce over the ice cream. 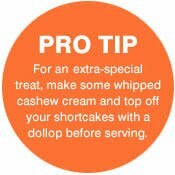 Serve the Shortcakes either open-faced or like a sandwich, with another placed one on top. Adapted from The Conscious Cook by Tal Ronnen. Tal's recipe for Whipped Cashew Cream can be found under the Kitchen La Bohème Recipies page on the sidebar: Hot Fudge Banana Split Sundae with Whipped Cashew Cream.